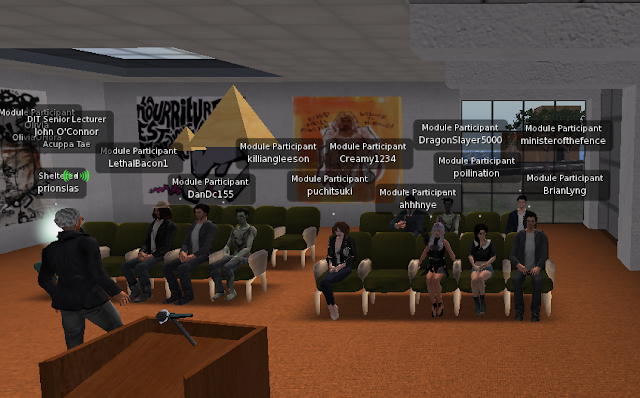 Sadly, the Virtual Environments module ended today with our final presentations. We created a video for our presentation which seemed to go well. 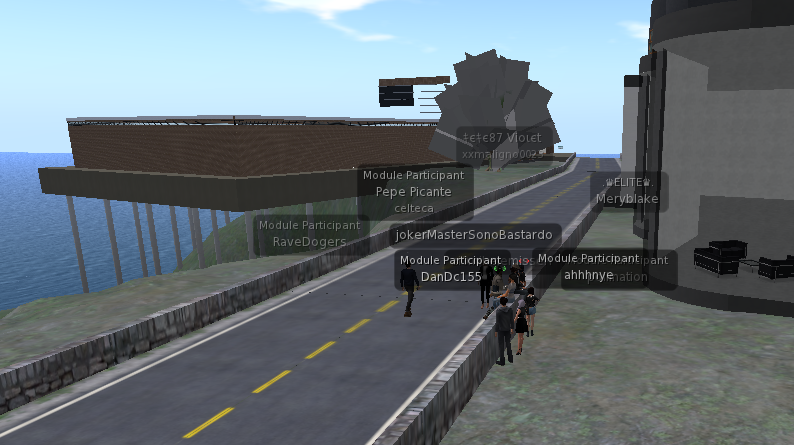 I enjoyed this whole module and the new concept of learning in an online classroom, and I only wish I could do it again. Thanks for everything John. Week 10: Playtime & Does Groupwork Ever End? This week we all got very distracted and John taught us how to build things and I made a giant burrito that I got stuck in then I turned it into a portal and basically that's what happened in class this week. Here are some snaps. I made John promise not to remove it but I feel like he will and that's the day I give up on art. 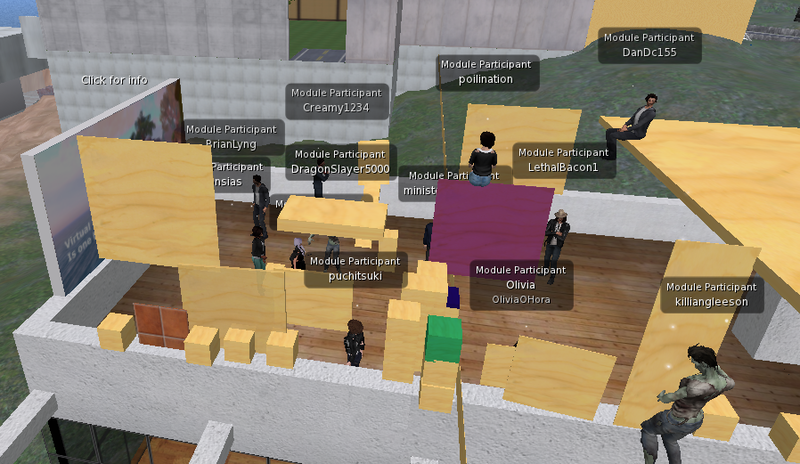 Anyway, in terms of the group work, we're trundling along nicely. We've split up the work into bite-sized chunks and we're using the typeface I designed that Joe found when Googling my name for the title screens. I'm excited to see what everyone else comes up with as it's a very open-ended brief and really you could go anywhere with it. This week my group has started to buck up a little in terms of finding specific angles and choosing how to structure our presentation. At the minute we are considering using video, but John mentioned that video in SL can be unpredictable at times, so we would have to use YouTube. I'm not going to lie, I'm a little uncomfortable with the prospect of having a video of me talking about group projects and people I know up on YouTube, so I'll probably make it a private video and share the link with the class. I found the readings on copyright to be both concerning and peculiar. There seems to be no strict system for copyrighting in Ireland and the whole thing is just a big blurry blob of a grey area. I find the archaic method of mailing your work to yourself and keeping it in the sealed envelope absolutely bemusing and I feel that this is an area that should be looked at in more detail, and efforts should be made to improve or maybe to rethink these systems entirely. I'm finding it difficult to find any information on my group online due to the vast amount of Google articles on people with similar names. I can find Joe's website, but that's the only thing I can find, and I already knew the URL. Dan proved even more difficult to research, which I had already anticipated. We've been using Facebook to keep in touch, although Joe had to create a fake profile in order to participate. It's a great mode of communication, but our main challenge is getting everyone in the same place at the same time. We all have conflicting schedules and my personal workload has been getting particularly heavy in the last few weeks. I feel like this could be solved by comparing class times and perhaps doing our own work and meeting for a very brief and convenient time to share our work. This week's task was to start getting to grips with the project brief. I suggested to my group after class one day that we should start to build a profile on each other based on our findings online. However, I believe that this may be a flawed approach, even though it seems to be what other groups have started to do. I believe it is flawed because my name is an uncommon one and it is relatively easy to find information on me online, which is a scary thought, but an easy task for my group to fulfil. A simple search brings up all events I've attended, projects I've worked on and anything that has my name attached to it. 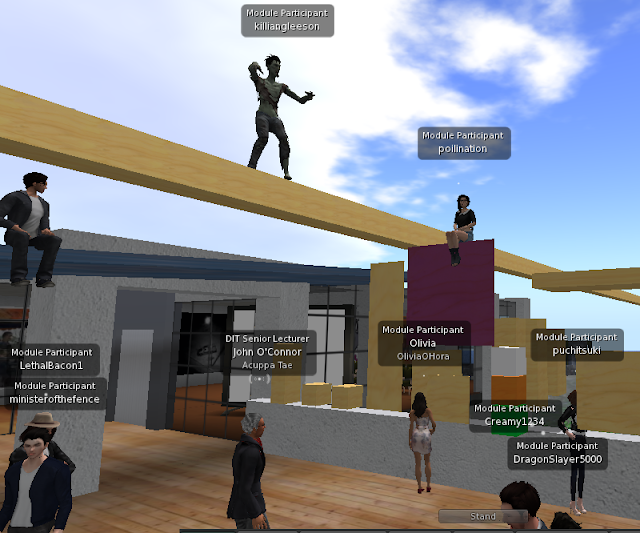 This week we were given a tour of Virtual Ability Island by Gentle Heron. 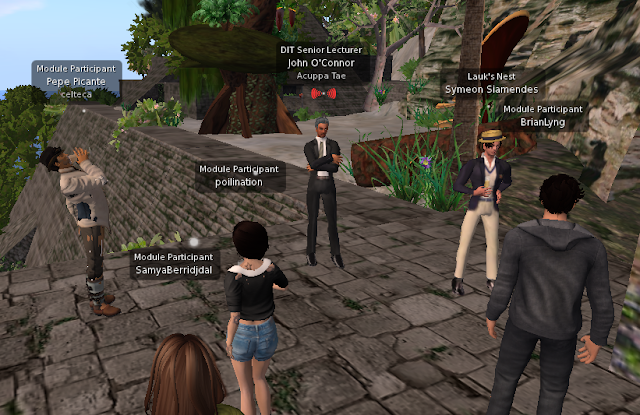 It was eye opening and encouraging to see that people with IRL disabilities could utilise SecondLife to craft a fully immersive and gratifying experience for themselves. Cape Serenity was my favourite part of the outing. I loved reading the poetry and enjoying the gardens with the animals. Of course regulation and etiquette are important in communities such as these, where acceptance of who you are is so important. I felt it courteous to detach my drink from my hand as Gentle Heron was giving her introductory speech. I think it's essential that respect is given to those who are kind enough to take time out of their day to show us their world. This week we went to Lauk's Nest, one of the oldest parks in SecondLife, built in 2004. Symeon Siamendes gave us a tour and answered any questions we had about the reserve. After the class had ended we explored Lauk's nest ourselves and I found a giant tortoise walking about outside someones house, so obviously I sat on it and went for a tour about. I was promptly joined by some of my classmates once they realised what was going on. All in all a great experience. After class I started thinking about what John said about crafting your personal brand online. I know that it's something all of us do once in a while. Making ourselves seem more employable and courteous by deleting old statuses on Facebook denouncing brands and people, photos of inappropriate behaviour and any information that might be too personal to have online. I know myself that I often google my name to find out how my online behaviour shapes my image and I try to delete anything with the rule of thumb that I wouldn't want my grandparents to see it. It's an act of self-preservation, of cleansing my online persona of any embarrassing misdeeds or cringeworthy comments. I think it's a vital part of having an online presence, that you have full control over your privacy and information.